De-clutter. If you have not gone through the clutter in your garage in some time, now is the moment to start. Start with the items you have not used in over a year. If you cannot come up with a good reason to keep them (such as an upcoming event where they will be needed), arrange to have them donated, sold or thrown out. Fix the flooring. Take out the stuff you plan to keep so you can focus on the floor. A high-quality epoxy floor has many advantages. Epoxy is easy to clean, stain-resistant and looks very professional. 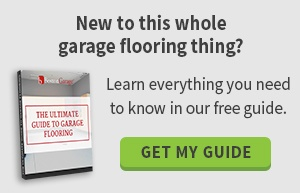 Plus, it blocks some moisture coming up through the floor, which keeps your garage warmer in the colder months. Build garage storage. 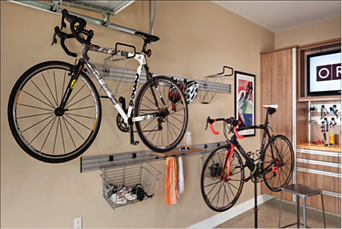 You may have thrown out the idea of custom garage storage, thinking it is too big for your garage. But, a custom fit is crucial for smaller garages. At Boston Garage, we can create a garage storage system for you that uses all the available space without looking cluttered or overcrowded. Use the walls. Once you have all the smaller items placed on shelves and in cabinets, you should not forget about the larger pieces of equipment. After all, shovels, rakes, ladders and brooms need to go somewhere that is preferably anywhere but the floor. If you install wall panels, you can arrange hooks to make hanging up these and other tools a snap. Maximize ceiling space. Look above your head. There sits a world of available storage space that, chances are, is totally unused. An overhead storage rack is fairly simple to install and gives you a great place to put items you do not use very often. Separate your seasonal items by the time of year and then put storage bins or boxes up there for a way to beat clutter and make it really easy to find your holiday decorations. Having a small garage can be a burden and a blessing. You do not have to worry about organizing a bigger space, but you must keep organized to be able to fit your garage in a small garage. By taking a systematic approach to garage organization, minimizing clutter and building the garage storage you need, your small garage will be exactly what you want it to be.